Feb 4, 2017 - The Mesa Verde Science Olympiad team came fourth at the Regional Science Olympiad competition held at Carlsbad High school on Saturday, February 4th. MVMS has qualified to go on to the State competition in April. There were 117 teams from 35 middle schools competing for top spots. Of the 90 students on our competitive team, 51 placed in the top 20 and won an award, 13 made it to the top five, and two placed first. There were 24 students from 8th grade, 31 students from 7th grade, and 35 students from 6th grade on the team. This accomplishment represents hours of practice outside of school time, and the diligent support of the coaches and parents who have been helping the team prepare with weekly meetings, since September. Congratulations to all the students for their hard work and excellent performance. We cannot express enough gratitude to the parents, coaches, volunteers, and sponsors who helped to make this happen. 8th - Skandhaa S. and Michael W.
20th - Ashley M. and Kyle N.
2nd - Saavan G. and Deepali Y. 3rd - Melody C. and Skandhaa S.
5th - Liliahana G. and Chhaya M.
7th - Catherine F. and Priyanshu V.
9th - Sarah S. and Daniel D.
4th - Tanisha P. and Charles Z. 15th - John H. and Ananya N.
5th - Sneha J. and Gary L.
5th - Ayush N. and Charles Z. 13th - Gary L. and Darren Z. 8th - Ethan L. and Jocelyn M.
7th- Sattwik C, Rishika G. and Caroline S.
20th - Ashley M, Ayush N. and Swasti S.
1st - Gary L. and Justin W.
5th - Olivia C. and Richard L.
9th - Kyle N. and Zoe X. 14th - Melody C. and Sneha J. 19th - Kyle W. and Tiffany W.
2nd - Lucas W. and Tiffany W.
4th - Sparsh M. and Ethan X. 6th - Niklaas E. and Skandhaa S.
19th - Alan B. and Priyanshu V.
18th - Morgan F. and Pooneh Z. 15th - Sazen S. and Edmund S.
3rd - Allyson D. and Richard L.
9th - Ethan L. and Pooneh Z. 15th - Michael W. and Darren Z. 7th - Niklaas E. and Caroline S.
12th - Charles P. and Karen S.
20th - Bryson L. and Deepali Y. 15th - Vania M. and Charles Z. 9th - (tie) - Prashasth K. and Michael W.
9th - James F. and Ayush N.
9th - Allyson D. and Richard L.
16th - Tyler B. and Tiffany S.
1st - Gary L. and Aakarsh V.
6th - Sneha J. and Aakarsh V.
10th - Sparsh M. and Miranda W.
16th - Catherine F. and Vishnu S.
12th - Angeline A. and James F.
19th - Daniel D. and Charles P.
3rd - John H. and Dave M.
5th - Suvali S. and Yuanping W.
7th - James N. and Aakarsh V.
11th - Saavan G. and Bennett W.
16th - Morgan F. and Divya J. You can request for a rules clarification and see the current rules clarifications from the links below. Please check back frequently for updates. Note: We are in Division B (Middle School). Visit the Events section to learn more about this year's events. 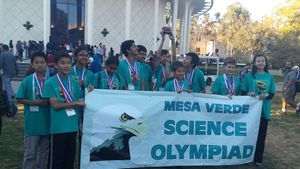 Apr 2, 2016 - The Science Olympiad team from Mesa Verde Middle School finished third at the Southern California State Competition held at the California Institute of Technology (“Cal Tech”) on April 2, 2016. Mesa Verde had the highest finish of any team from San Diego and trailed only perennial state champion Muscatel from Los Angeles and Orange County winner Kraemer. The field consisted of 30 middle school science teams from the Southern California region, which encompasses Los Angeles, Orange County, the Inland Empire, and San Diego. Mesa Verde earned the trip to the state competition by finishing third at the San Diego regional competition on February 6. The top eight teams at the San Diego region qualified for the state competition. Now in its 32 nd year, Science Olympiad is one of the premier science competitions in the United States. Over 7,000 teams from all 50 states compete each year at the middle school (Division B) and high school (Division C) levels. Students compete in 23 different events covering the three broad areas of Science Concepts and Knowledge, Science Processes and Inquiry Skills, and Science Application and Technology. Some events are knowledge-based and involve studying and testing, others are hands-on events usually involving laboratory-type skills, and still others are engineering-based and involve creating devices to accomplish specific tasks. Feb 6, 2016 - The MVMS Science Olympiad team took Third Place at the regional Science Olympiad competition held at Carlsbad High school on Saturday, February 6th. There were 113 teams from 34 middle schools competing for top spots. Of the 90 students on our competitive team, 67 (74%) had at least one finish in the top 20 and won an award. Thirty-three students placed in the top ten and 15 placed in the top five out of the 113 teams. There were 35 8th graders, 23 7th graders, and 32 6th graders on the team. This accomplishment represents hours of practice, outside of school time, and the diligent support of the coaches and parents who have been helping the team prepare, with weekly meetings, since September. Congratulations to all the students for their hard work and excellent performance and and a big thank you to Michelle Q, Alex Y and Aryan D who attended the entire day to support the team and be on standby for backup. We cannot express enough gratitude to the parents, coaches, volunteers, and sponsors who helped to make this happen. MVMS will go on to the State competition in April.